The YMCA WINTER MARKET has moved. It is now located at the Grace Covenant Presbyterian Church at 789 Merrimon Avenue from 10 to 12:30 every Saturday morning until April. That is the church with the giant community garden in the front yard facing Merrimon Avenue – most of the harvest goes toward feeding the hungry. With only a few minutes to shop, I stocked up on grits and eggs from East Fork Farm, two kinds of potatoes from Meadow Cove Farm plus some beautifully dried shiitake mushrooms, AND a beautiful apple turnover decorated with a heart (smile) from Aimee Mostwill of Sweetheart Bakery plus a yummy coconut shortbread cookie. On this blustery day, doesn’t a cozy soup (based on potatoes and shiitakes) with an warm apple turnover for dessert sound marvelous and comforting? NOTE: All the greens were gone quickly…I missed them by a long shot. Meanwhile over at CITY MARKET, Missy of Jake’s Farm said she sold out of her veggies within ten minutes. Wow. Asheville City Market’s winter location is indoors at the Public Works Building on Charlotte and Eagle Streets from 10 to noon. Hint, hint…Don’t lollygag like I did. Get to these Saturday markets at 10 o’clock if you are serious about winter greens! Farmering In Winter…Where Is Spring? I am aching for spring. Since I work outside, the weather is an ever-present phenomenon, and it seems that the mild mid-winter has morphed into a very mean late-winter. The wooly worm was right! Monday was spent attending to a new shipment of fruit trees in biting wind. Tuesday got colder as the day went on. Wednesday…ahhh…the sun actually stayed out for most of the day. It wasn’t warm, but it wasn’t grey either. Our tailgate market farmers have to move forward with determination despite the bitter weather. To get goods to the market as early as possible, you can bet that many of their days are spent outside on these fierce windy days. Stuff has to happen while we are sitting on our cozy sofas drinking tea. Otherwise, when the spring markets open there would not be anything for sale. Farmers are BUSY right now – growing transplants, planting seeds, plowing ground, cutting down cover crops, birthing baby animals, building structures for the coming year, repairing greenhouses, fixing machinery, maintaining fruit and berry plants, and God knows what else. All of these tasks are done by the farmers with a leap of faith that rain will come when it is needed, that the plants will produce, and that someone will buy their goods. the way they pay their bills and buy their kids shoes. As I have said before – farming is a labor of love and we are the lucky recipients. Lets support them now (at the winter markets) as we anticipate the arrival of the spring markets soon. Best wishes and praying that the weatherman got it wrong. January has been wishy-washy…first cold, then warm, then ice and snow, then flooding rain, then fierce winds, then sunshine and calm. But no matter what, we ARE one month closer to spring and that always makes me happy. Winter jasmine is blooming, forsythia buds are swelling, and I saw one or two quince flowers last week. We even heard the sound of frogs during a warm spell. Surprise! Cilantro is thriving under row cover in my garden. What an awesome addition it made to the mango/avocado salsa we concocted for fish tacos last weekend (thanks to Amelia & Drew). 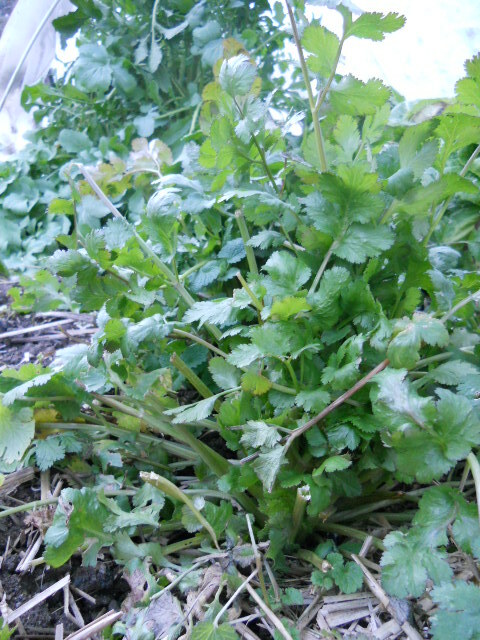 Until this winter, I had no idea cilantro could take that much cold weather. In fact I hadn’t checked my garden lately and was astonished to find such happy cilantro. Conclusion: Plant cilantro in fall and enjoy it hopefully until the following summer. I have two patches of arugula. The arugula under row cover is huge and starting to bolt. The other arugula patch is out in the open and, along with the unprotected spinach, clings to the ground for warmth. 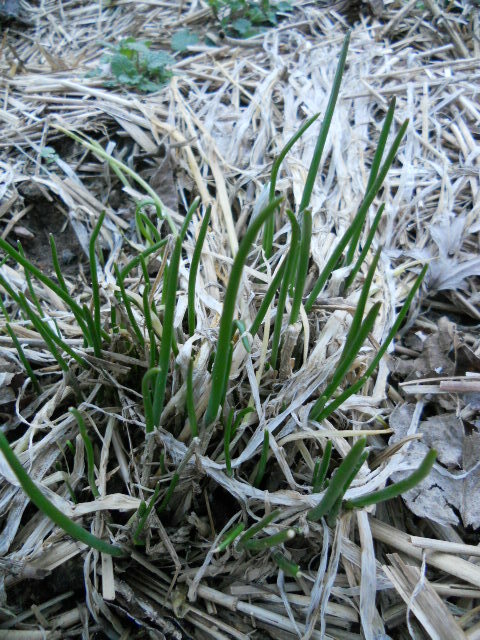 Chives are starting to pop up (they are happy that spring is coming too!). Its time to start thinking about planting sugar snaps (on Valentine’s Day) and sneaking in some potatoes in March. And of course, seek out the winter markets for a LOCAL fix. Get up on Saturday morning, down some coffee, blast yourself off your cozy sofa, and get there early-ish. You’ll be surprised by the selection, even in January, uhh I mean February. Great market this morning at Reynolds Village (by Woodfin Y). Here are just a few pictures to whet your appetite. The market was indoors today at the LOFTS diagonally across from the Woodfin Y. Cecelia’s Empanada Truck was outside for your delicious empanada fix. Also there were eggs, meat, maple syrup, fresh greens, and more. Got Some Sweet Potatoes from Flying Cloud! Cecelia’s Empanada Truck ~ Yum! Today marks the first “winter market” at the Woodfin YMCA. It is not actually inside the Y this year and will be held outdoors if weather permits or at the LOFTS at Reynolds Village (Building 51). This building is located diagonally across the intersection from the Y. Parking is easy. Hours are short…from 10 – 12:30…but so worth the effort to get great eggs, cheeses, breads, meats, pasta, chocolates, coffee, value-added items, and even some fresh greens and vegetables from our local producers. Don’t let winter change your habits! Eat well and LOCAL all year long. Other markets open next Saturday (like the indoor Asheville City Market from 10 am-1 pm on Saturdays at the Haywood Park Hotel atrium).